The name of this Austrailian staple says it all. The Blundstone 500 Series Classic Boot is a true classic, providing the wearer with rugged style any time they're pulled on. The sole, footbed and upper are all designed to provide enhanced foot comfort whilst maintaining the classic look of the iconic style 500. The premium tanned leather upper of this Blundstone boot softly secures your foot and the leather lining offers additional comfort. 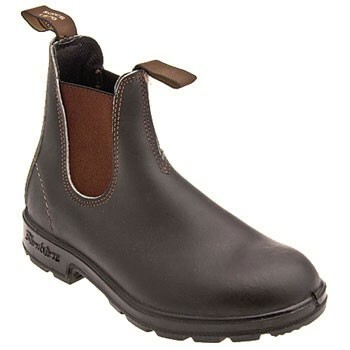 This Blundstone boot features an expanded EVA footbed with Poron insert in the heel strike zone and the shock absorption systems let your feet bounce back all day long.This Blundstone boot has a soft polyurethane micro cell midsole that gives comfort and support and the tough urethane outsole has good slip resistance even with long wear. For durability and a classic style, you can count on the Blundstone 500 Series Classic Boot. Blundstone has been making their sturdy and unique boots in Tasmania, Australia since 1870. For over 130 years, they have remained a family owned company and maintained the quality, integrity, and authenticity of their products. Versatile, comfortable, and protective, the Blundstone range sets the standard for quality craftsmanship.